Our latest Twitterbake from Nick Malgieri’s Bake! was chosen by Abby, although I think she may have been channeling Kayte, who has been talking about this recipe since she got the book. Once I tasted them, I knew why. These bars were so good! To make these bars, I began by mixing up a recipe of sweet pastry dough, which is simply flour, sugar, baking powder, salt, butter, and eggs pulsed together in the food processor. I made the dough the day before I planned to bake the bars, wrapped it well in plastic wrap, and put it in the fridge. The next day, I took the pastry dough out of the refrigerator, whacked it a few times with a rolling pin to soften it, then rolled it out to fit the pan. I transferred the dough to the pan, which I had prepared by lining with buttered parchment paper. 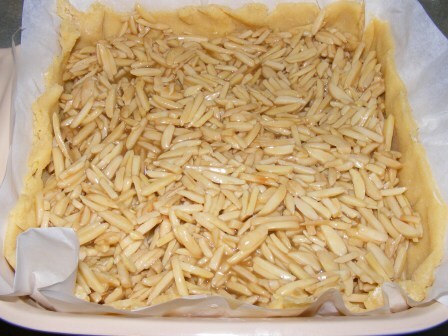 After pressing the dough into the pan and trimming the top, I put the pan in the refrigerator to chill while I made the filling. The filling was easy to make. I melted butter in a pan, added sugar, brown sugar, corn syrup, and salt, then stirred in cream. I cooked the mixture for a minute, then added the almonds. After stirring everything together, I dumped it into the prepared crust and spread it around. I baked the bars for about 30 minutes, until the crust was done through, the syrup bubbling, and the almonds well toasted. I cooled the bars on a rack for an hour, then unmolded them from the pan, peeled away the parchment, and cut the bars into 2-inch squares. The bars were wonderful — tender, moist, slightly chewy, with a nice, toasty crunch from the slivered almonds. The whole family enjoyed them, which was a good thing. Otherwise, I might have eaten them all myself. Mmmmmmm…your post really makes me want to make another pan NOW! These were so dangerously tasty. And thanks for making them in the proper pan so I can see what mine *should* have looked like. =) Ah well, next time! Actually, I made them in a smaller pan, as I halved the recipe. But I think the proportions were about the same, so I think they look like they should. I have to get going on this. I was waiting for Margaret to make the Danish since it was her choice and I didn’t want her to have to make them alone, but I think she is full of other things at the moment, so I need to make them or move on and post them later with her. At any rate, I cannot find slivered almonds right now…have been to three different stores so hopefully those will appear soon, is there an almond season or something? 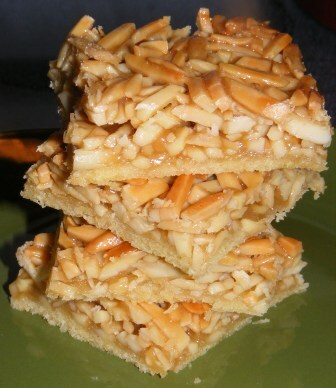 lol Your bars look wonderful and I have been waiting since I got the book to make this recipe!! Our grocercy recently added a big dired fruit and nuts section, so they pretty much have everything all the time. Hope you find them soon, as these bars as so good! Just mixed the dough for these bars when I received the notification about this post ;-). The dough is sooo good, look sooo forward to making them tomorrow. They look so delicious! Can’t wait to hear how they turn out. They were wonderful!